Interested in writing a guest blog post? Please fill out this form! It’s unfortunate that the world’s largest “drone” maker in the world is privately held because their company’s future, as well as their stock, is something that I, among countless others I’m sure, would be largely interested in throwing a few dollars at! In 2015, Frank Wang, the company’s CEO, was quoted as saying “you can’t be satisfied with the present.” Keep in mind that was said at the release of the Phantom 3 Pro. That was before the release of the Inspire 1, which is arguably the world’s best cinema quadcopter at the time of its release. Since that statement we’ve seen DJI announce and release the Inspire 1 Pro, the Inspire 1 Raw, its handheld companions the Osmo, Osmo+, Osmo Mobile, Ronin-M, Ronin-MX, the M600, the Focus, Lightbridge 2, the Phantom 4, and now recently the Phantom 4 Pro and Pro+, the Inspire 2 (now available with CinemaDNG and Apple ProRes licenses), and the ever popular DJI Mavic. All of that in just 2 years! And we haven’t even mentioned the awesome firmware releases during that time that can enable 10+ flight modes including waypoint flying, active-tracking, tripod, terrain follow, and on and on just to name a few. On top of all that, nearly 80% of all FAA registered drones in the United States are manufactured by none other than DJI. 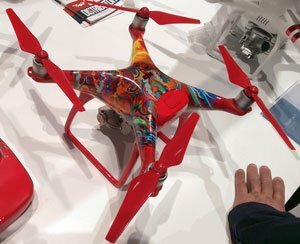 Phantom 4 color option shown at CES 2017. In addition, they have officially entered the portable/on-camera monitor market as well – that will compete with the likes of companies such as Marshall and SmallHD. In the 4th quarter of 2016, they announced the Crystal Sky 7” and 5” monitors, and this week at CES in Las Vegas, they showcased a working prototype that boasts a resolution of 2.7k – also claiming that no sun hood is needed as it provides 2,000 knits of brightness. That’s twice the resolution and twice the brightness of any 7” monitor of its kind, and three times brighter than an iPad Mini 4! It’s safe to say that DJI is no longer just an aerial company, but more accurately put, a cinema/story telling company. They doubled their annual revenue in 2015 to $1 billion, and is currently valued at $10+ billion. Which, we might add, is roughly six times the current market cap of GoPro. We’re safe to assume that their revenue didn’t drop at all this past 2016 year (possible even spiked) since the Phantom 4 Pro and Pro+, Inspire 2, and Mavic were all announced in 3rd quarter and released in the 4th quarter 2016. We, TVS Pro, also saw a big spike (doubled) in our YouTube traffic on December 25th and three days following! It was definitely the Christmas year for drones! There can be a slight curve to learning some of the newer systems. We help provide the tools, but the knowledge as well, so that you can take full advantage of what DJI tech has to offer. How can you take advantage? Our ever growing YouTube channel is one popular way. We’ve got two new videos that will be launched within the next week or two: “DJI Inspire 2 Unboxing, Setup, & Sample Footage”, and an updated current version of our most popular “DJI Intelligent Flight Modes (Part 2): FULL Instruction.” Watch for those, and please subscribe. We also recently released three Mavic instructional videos. TVS Pro is Utah’s first DJI direct dealer and Aerial Cinematography Experts and we include one-on-one training with every purchase. 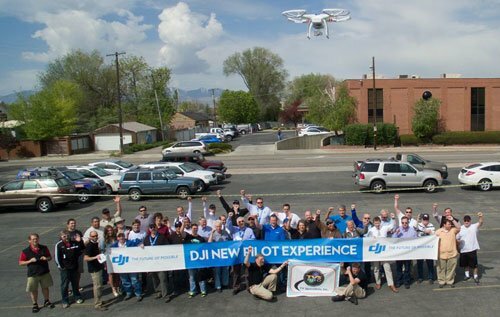 We contract with them and provide a minimum of four DJI Sponsored Events per year, including: New Pilot Experience (Check out the takeaway notes here), and Moving With Cameras. Both are very informative with hands on training and demonstrations, as well as some free swag and raffle drawings. Those dates are unconfirmed as of yet, however, liking us on Facebook and other social media venues are a quick and effective way to stay on top of up and coming TVS Pro Seminars and Workshops. This entry was posted in Aerial Cinematography & Drones and tagged Apple ProRest, CinemaDNG, crystal sky, dji, dji mavic, gopro, inspire, inspire 2, Lightbridge 2, mavic, Osmo, Osmo Mobile, phantom 4, phantom pro, Ronin M, Ronin-MX, the Focus, the M600, the Phantom 4. Subscribe to get new post notifications.